Growing plants hydroponically is not as hard as many people are lead to believe. It used to be that if you wanted to start growing hydroponic plants, you had to invest a lot of money in equipment and materials get started, today that just isn't the case. As the popularity and the demand for hydroponics keeps growing, more and more companies are putting together starter kits for beginners, at affordable prices. While you can go out and invest a small fortune buying high tech equipment and supplies, you really do not need to. Don't get me wrong, if you have the money and want to spend it, there are some amazing kits out there that can really automate the entire process for you. But how many of us can truly afford to shell out a mortgage payment for something that we could just as easily get done on a cheaper scale? For the purposes of this article, we are going to assume you are new to hydroponics and we will go through some of the basics first. 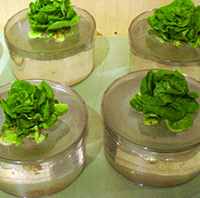 Read on for more hydroponics how to. Hydroponics is more than just a hobby, it is a sustainable way of growing. You will find that there are numerous advantages to growing hydroponically than growing in a traditional garden. The first, and probably the most obvious is you do not need a yard to get started. In fact, you don’t even need to be outside at all. That advantage alone makes hydroponics ideal. With the right conditions, you could grow plants indoors all year round. Imagine having fresh vegetables picked right off the plant in the middle of winter! Another advantage to hydroponics is there is no tilling or weeding. Since you aren't growing in soil and you have complete control over the growing environment, you won’t have to waste your time, or break your back tending to the garden. You can also set up your plants on a table or bench so you will never have to work at ground level. Plants grown hydroponically can outperform those grown in a traditional garden, if tended properly. You will find your hydroponics how to system will grow faster and produce more as well, making this system ideally suited for growing vegetables. You will need to familiarize yourself with the basic components of a hydroponics how to system if you are going to start growing. The first part is the reservoir. This will hold the water and the nutrient solution that will feed your plants. You will have a tray, or growing chamber, which will be used to hold the plant itself. If you are using an ebb and flow system, you will need a submersible pump that will go into the reservoir, this is what feeds the nutrients up to the tray. Since you won't have the benefit of sunlight, you will need to get some sort of lighting. A cheap shop light will suffice and you can buy special grow lights to fit it. You will need some sort of timer for both the pump and for your lights. You will need a growing medium to start your plants in. Common examples are rockwool, peat moss, sand, and vermiculite. You will also need to buy the nutrient solution that will ultimately feed your plants. These will be plant specific in many cases so you will need to decide what you would like to grow before getting started. Ok so now that you are familiar with the individual components that make up a system, you will inevitably be faced with a choice of what to buy. Do you try to put your own system together or do you go out and make the investment in a complete system that has all the components that you need? 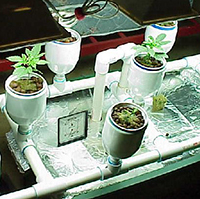 If you are just getting into hydroponics how to, it is advisable that you purchase an inexpensive system to get started. In the end it will probably be cheaper than if you built it yourself, and in the long run the experience you gain early on will be worth every penny you spent. 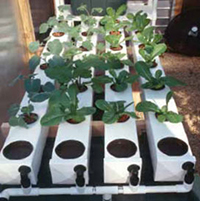 Once you have grown a few plants using your first system, you will find out quickly if hydroponics is for you or not. Trust me it is much better to find out early on, before you invest a lot of money, if this is going to be all you had hoped it would be. 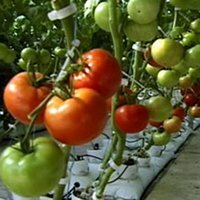 Some entry level hydroponic systems range upwards of $600, this is a lot of money to go to waste if you start growing and decide you don't enjoy it. You can always spend the money later if you do, but you can never get it back if you don't! Once you actually start growing, you will most likely discover that hydroponics is not all that different from growing plants outside in the garden. The growing medium is difference, and the tools are different, but in the end the plants themselves still need the same things to survive. Be sure you have the right amount of light. Use a timer to cycle 12 hours on and 12 hours off. Temperature is also very important and sometimes is specific to the plant type itself, but as a general rule of thumb you can grow in temperatures ranging from 65 degrees up to 85 degrees. You want to have a medium amount of humidity for most plants. Be sure to monitor your pH levels very closely, if the pH is too high or too low, the plants will not absorb the nutrients efficiently and will become deficient. You can buy test kits in pet stores, hardware stores, and most garden centers, to make sure the water in the reservoir is just right. 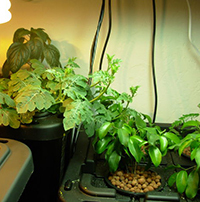 These are just a few of the basics of hydroponics how to to help you get started!